This Slot is another out of the ordinary slot with a huge 100 win-lines featuring 2 separate sets of reels with different number of rows. Like a lot of the Williams Interactive slots this one is different in many ways and they have even written their own music score for the bonus round. Based on the 'Jack and the Beanstalk' theme (like this one from NetEnt) this is a great diversion for players looking for a change-up from the standard slot setup. This page gives you a detailed guide to the Giant’s Gold slot game. First you will find a description of the game basics and the complex setup. After this you will find out about the Free Spins Bonus Feature, Colossal Reels bonus, Wild Reels and the Wild Feature. Next I have given my verdict of the Giant’s Gold Slot compared to other standard slots. You will find information on the slot’s compatibility with your devices at the end of this review, along with an unbeatable casino for those who would like to play. 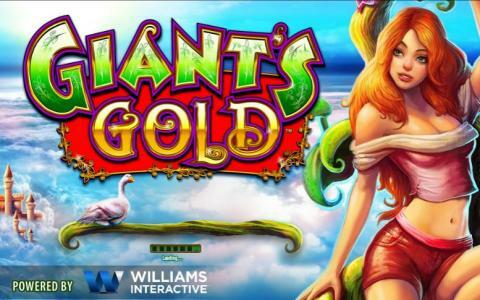 Giant’s Gold Slot is a 100 pay out line Colossal Reel slot by Williams Interactive (WMS). The game has 2 sets of reels the main set is 5 reels on 4 lines and the Colossal Reel set is 5 reels on 12 lines. The whole theme of the game is based on the children’s fairy-tale Jack in the Beanstalk. In play you can wager from $0.50 to $100, and with an impressive RTP of 96.21% this game compares favourably with other slots. The higher value symbols have all of the characters and icons from the fable include Jack, the beanstalk, food, a golden harp, a goose, a golden egg and the giant. The lower value symbols are the standard Ace, King, Queen, Jack and Ten. The wild symbol in the Giant’s Gold Slot is the Beanstalk, which completes all standard winning combinations. If you stack a reel full with the wild Beanstalks in the main 5 x 4 reels game, this will transfer you over to the Colossal Reels to the same reel stacking 12 wilds. If you get 2 or more stacks, this can increase the pay-out dramatically. The other bonus symbol is the Golden Egg. The Giant’s Gold bonus round, if triggered offers hefty pay out with up to 100 free spins. To trigger the bonus round you need to land 3 Golden Eggs on reels 1, 3, and 5 of either the main reels or the Colossal Reels. This will give you 5 free spins, but because the symbols are stacked it is possible that you will land more than 1 egg on each of the reels winning many more spins. For each additional golden egg landed on the reels you get an extra spin. If you have 40+ Golden Eggs you get 100 free spins. While you are playing the free spins round you can add even more spins by landing more Golden Eggs and this will also multiply your win 2x. Another great feature that Giant’s Gold has to offer is the music score that plays when you are in the free spins round. In main play you listen to farm animal sounds and the occasional footsteps and laughter of the giant above. Then when you enter into the free spins round this turns in to a score produced and written by the Williams Interactive developers and it is a very unexpected rock version of Fee FI Fo Fum, with special lyrics. How Does Giant’s Gold Slot Compare to Standard Slots? Giant’s Gold Slot is in play and appearance very different to your standard 5 reel 20 – 25 line slot. There aren’t many slots with 100 pay out line and 2 games in 1 like this slot. Having non-traditional slots is a normal trait of Williams Interactive software. This slot does regularly pay out but only in small amounts, but if you trigger the free spins then you can build up your cash. Although many of Williams Interactive slots are available to play on mobile devices through their HTML5 mobile platform. Giants gold is not yet suitable for the smaller screened phone devices. For the full effect I recommend you play the browser version on your PC or Mac. You can find Giants Gold (along with many other WMS titles) in the 'Vegas Slots' section at BetFair Casino. These games compliment the main PlayTech and IGT range. Betfair are well known for their casino promotions, which put other operators to shame! Check out www.betfair.com for the latest deals.